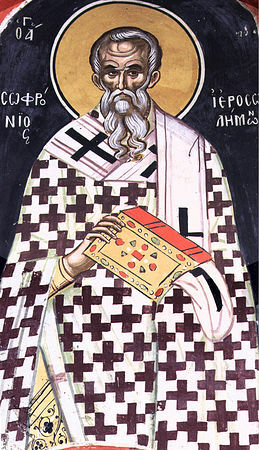 On the eleventh of this month [March], we commemorate our Holy Father Sophronios, Archbishop of Jerusalem. Our Holy Father Sophronios (550-638) was born in the province of Damascus, of the region of Phoenicia, from pious and wise parents, his father being called Plinthas and his mother Mira. As far as his genius and education, he acquired the entire capacity of all the sciences. Not only this, but while living in the city, he conducted himself in virtue and asceticism which he accomplished in the desert under the ascetics. Then he went to the Monastery of the Great Theodosios the Cenobiarch, and from there withdrew to Egypt, longing to acquire greater learning in wisdom. There he found a man named John, full of every kind of internal and external wisdom. Having attained his desire, he dwelt with him, receiving from him all the lessons he knew beyond what he already knew, while he also transmitted to him what he knew. While there, he experienced a problem with his eyes, and he was healed by the Holy Unmercenaries Cyrus and John, for which they sought payment through his words, to write about their miracles that take place every day, and he wrote these at the request of the Saints, then he returned to Jerusalem. Then, because of his overabundant virtues, he was ordained Bishop of Jerusalem. At the time Jerusalem became enslaved to the Persians, the Saint went to Alexandria, to the great John the Merciful, who was then the Bishop of Alexandria. When the divine John departed to the Lord, then the sacred Sophronios composed a funerary encomium discourse, in which he showed the immeasurable treasure of the mercy and compassion which that thrice-blessed man had in his soul, and he mourned his absence. Later when he returned to Jerusalem, who is able to speak of the amount of care and labor he shepherded the flock he was given? For he not only noetically wrestled against the demons, but he rationally battled against the heretical Monothelites, which he overthrew either through the Divine Scriptures and the apostolic and patristic traditions, or he conquered them with their own teachings. This renowned Father left many valuable letters and memorials for the Church of Christ, among which is the wondrous life of the equal-to-the-angels Mary of Egypt, who struggled in the desert with struggles beyond the measure of human nature. In such a good and God-loving manner did the blessed one conduct himself, teaching others, being according to Jeremiah anointed with the words of God, so after three years of shepherding the flock of Christ, he departed in peace to the Lord. 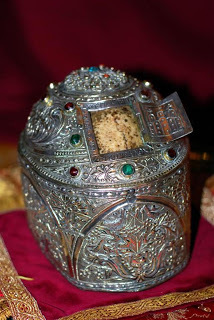 The Skull of St. Sophronios in the Monastery of Panagia Phaneromeni near Corinth. The truth of things hath revealed thee to thy flock as a rule of faith, an icon of meekness, and a teacher of temperance; for this cause, thou hast achieved the heights by humility, riches by poverty. O Father and Hierarch Sophronios, intercede with Christ God that our souls be saved. O Father Sophronios, thou wast glorious in the splendour of sobriety, and didst reveal thy ineffable enlightenment from heaven through the radiance of thy words. For by thy life thou didst attain to wisdom and dost now confirm thy Church, as an illustrious Hierarch and intercessor for us with the Lord. Inspired by the Spirit, blessed Sophronios, thou wast a righteous Hierarch in Zion as an emulator of the Apostles.